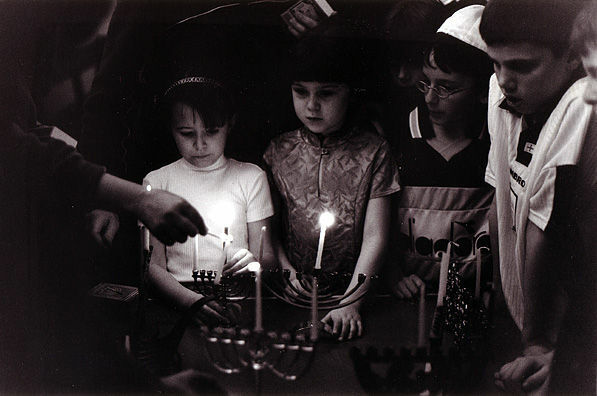 Hanukkah at Synagogue, Lansdowne Road, Hove: Children from the Synagogue's religion school light the first of the eight candles of Hanukkah, (festival of lights). 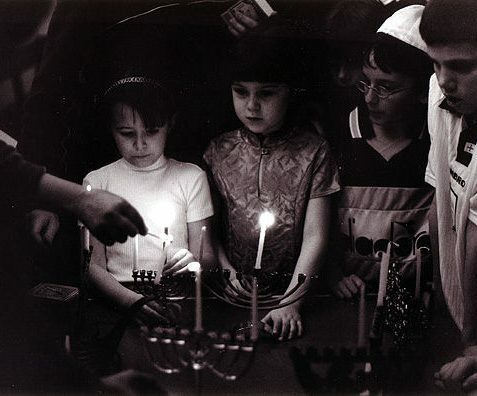 A candle is lit every day of the festival to commemorate the rededication of the Temple at Jerusalem after the victory over the Syrians. 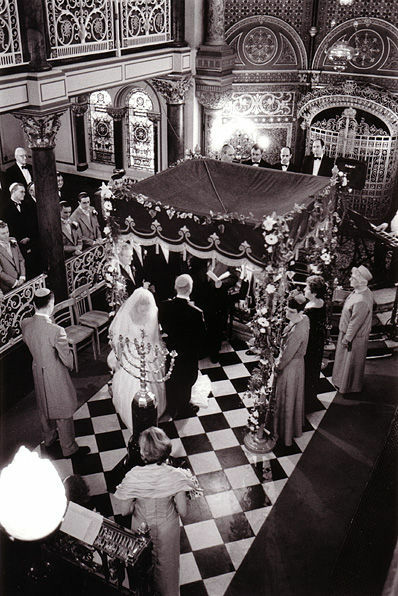 Chuppah marriage ceremony, Middle Street Synagogue, Brighton: The bride circles the groom under the Chuppah (canopy) in an orthodox marriage ceremony. 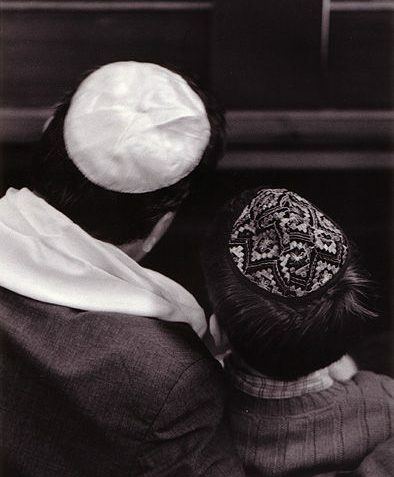 Father and son reading the Siddur in the synagogue, Lansdowne Road, Hove, December 1998: The Siddur is the Jewish prayer book used on weekdays and Sabbaths. 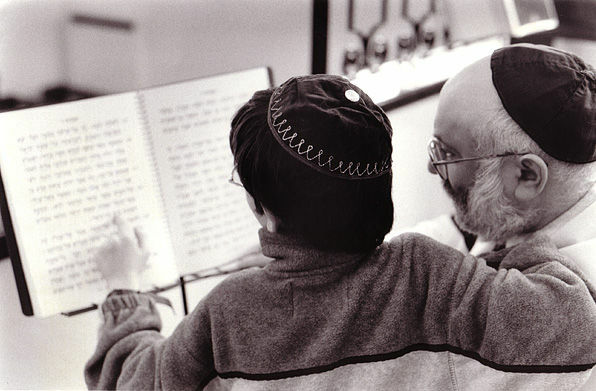 The Siddur has its origins from the 9th century as an attempt to harmonize Jewish practice worldwide. 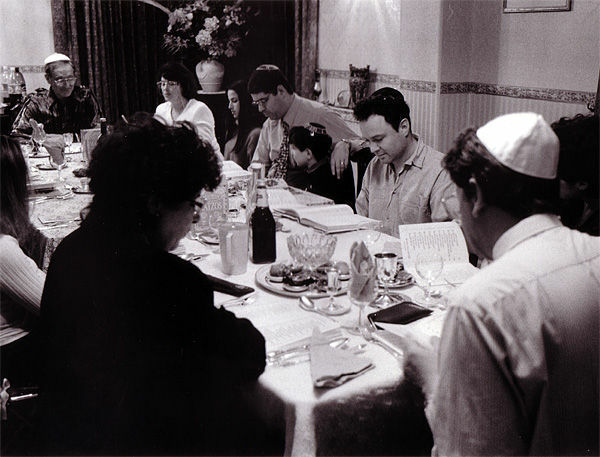 The Siddur is written in Hebrew and English. 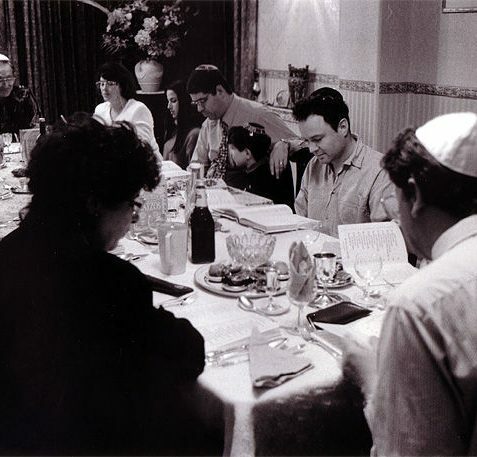 All of the various denominations within modern Judaism have their own versions of the Siddur. 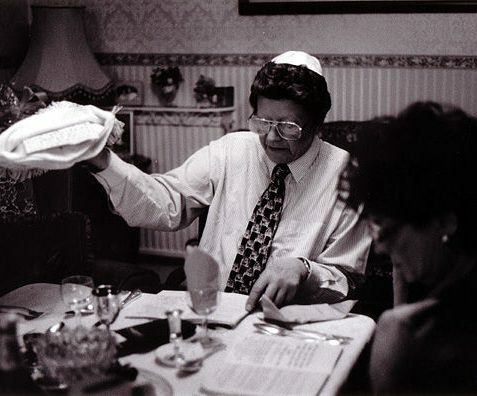 The My Brighton and Hove website is pleased to publish a set of photos by Tony Tree illustrating contemporary Jewish life in Brighton and Hove. 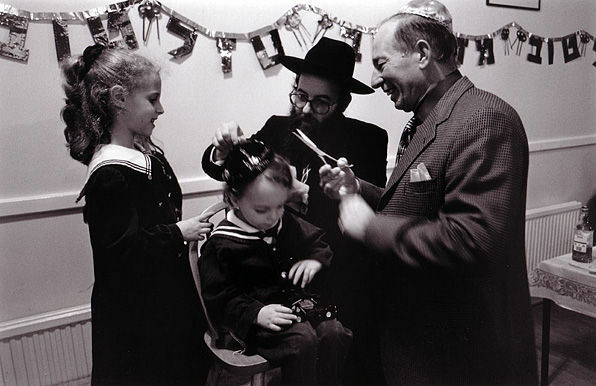 These photos were part of the Masoret exhibit at Brighton Local Studies Centre in May-July 2003. Please add your comments to the photos. I’ve recently discovered this fine website and have been enjoying it thoroughly. 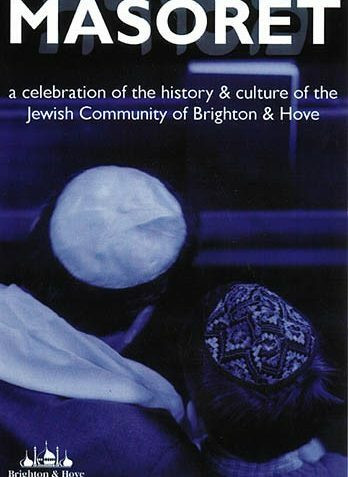 Noticing the section on Brighton’s Jewish community made me wonder if any contributors or readers might be able to offer any thoughts on a puzzle that my family have been pondering for many years. My grandmother, Caroline Sandilands, was the first of our family to move to Brighton, somewhere around the end of the First World War. She spent the rest of her life there and raised her two children as a single parent, retaining her maiden name. She was a secretive woman who, if slighted even in a small way, would tend to blank people from her memory. And so it was with the father of her children, of whom my mother, Chiquita Sandilands, was one. Any attempt to discover the identity of this man proved fruitless. It was only when my uncle died a couple of years ago that a tantalising hint came to light among his documents. A small scrap of paper identifying his father as ‘S.Haber, British Jew’. Caroline worked in the clothing trade so Mr Haber may well have been in the same line of work. They must have been together for some time between the late 20s to mid 30s. If anyone reads this and can shed any light on the name Haber I’d be thrilled to hear from them. For all I know, I may have extra Brighton relatives that I know nothing of. My family moved to Brighton in 1953 from Streatham in South West London. My grandparents, Nathan and Rebecca Blow, were already living in Brighton on Roedean Crescent. 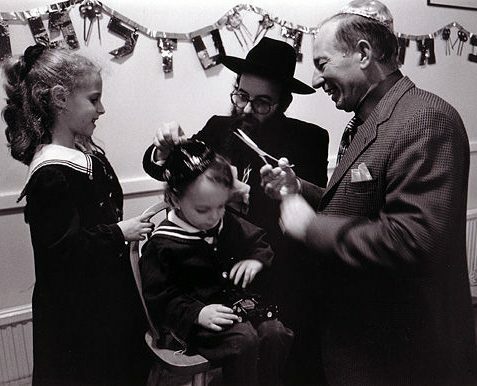 My grandfather, Nate Blow, was a member of Middle Street, Orthodox Shul and so my family also joined that shul. 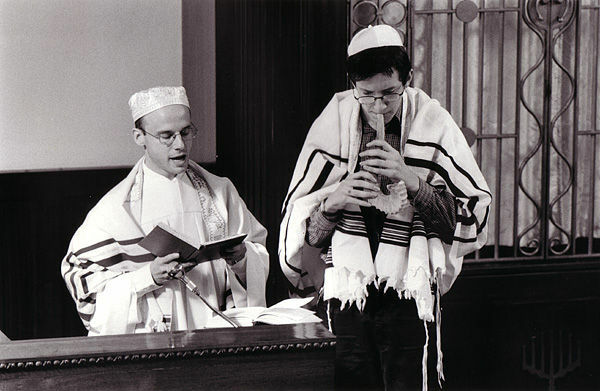 Rabbi Fabricant, a brilliant academic, was the Rabbi and Reverend Bronstein was the Cantor, who had a fine tenor voice. I remember Mr. Silver and Mr. Crook who wore top hats and were the President and Treasurer of the congregation and characters such as Mr. Green and the Black Prince, whose real name I cannot remember. The Shul was very beautiful inside, of eastern design. 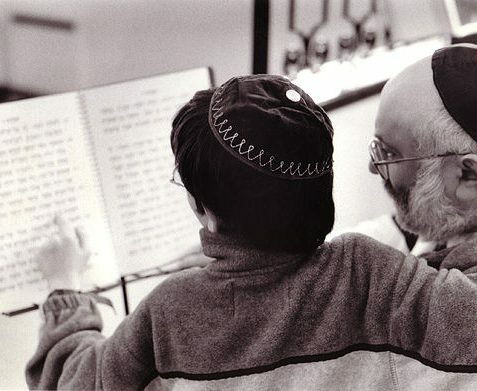 For me, going to shul was a weekly ritual, going with my grandfather and my middle brother, Nick. 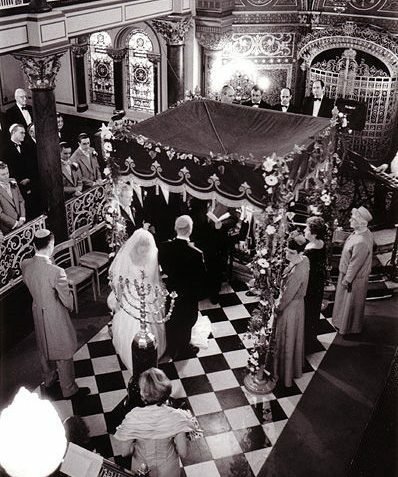 I had my barmitzvah there in November 1959, my haftorah being Toledot. 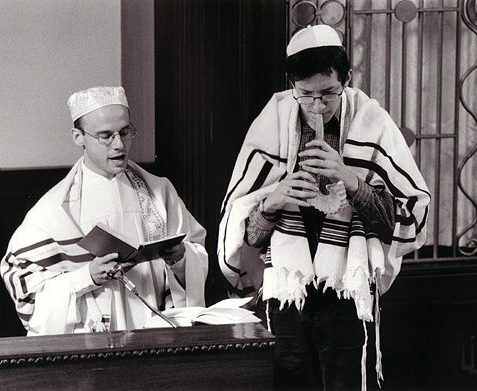 Mr. Green was my barmitzvah teacher. 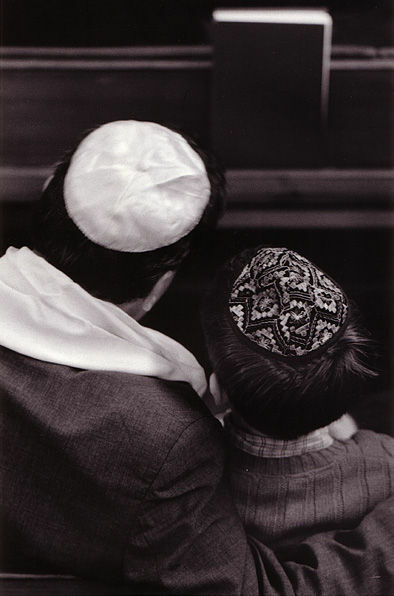 The shul was not a spiritual place for me. There was too much talking, especially about business and too little concentration on the service itself. I remember members of the congregation getting impatient with Reverend Braunstein for taking what they perceived as too long over the service. 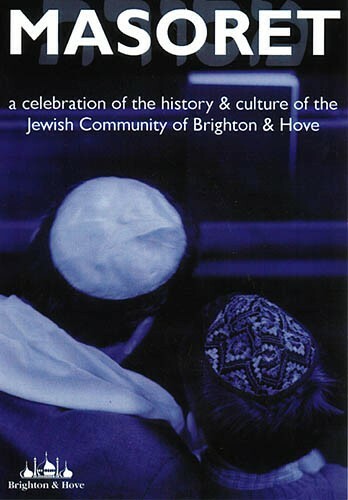 I have returned to Brighton on many occasions since I emigrated to Canada in 1976 but have never returned to the shul. 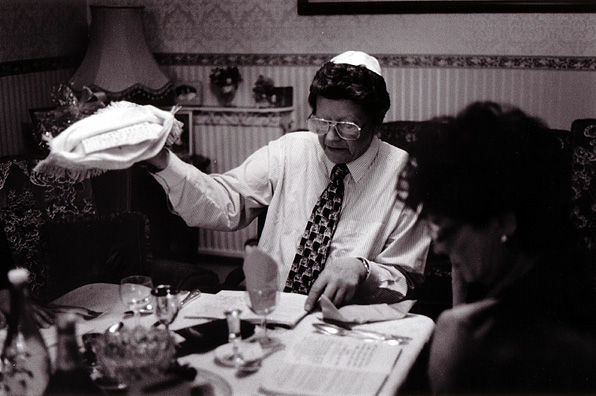 I would enjoy hearing from anyone else who has memories of Middle Street Shul. I lived at 44 Grenville Place as a girl until the whole area was raised for Churchill Square in 1965. Also belonged to Middle Street synagogue. I’m looking for any help please in tracing some relatives who apparently lived in Wish Road, Hove in early 1960s; there were 3 elderly ladies by the name of MORRIS, DIAMOND WEISMANN or BENJAMIN? My uncle in Australia is trying to piece together parts of his life. I believe my dad spent WW2 in Brighton after leaving Germany on the Kindertransport. His name is Kurt Penner. Did anyone know him?